Lots of things are shaking up the traditional power model. A decade ago gas and coal power plants were very profitable. Retail companies, which distribute to industrial and household consumers, bought wholesale electricity at a price that always covered operating costs and got a healthy boost during peak demand hours. Even fairly inefficient power plants could expect to have enough profitable operating hours to keep in the money. Electricity generated from renewable energy sources has altered this dynamic, most noticeably in Germany where Energiewende policies encourage renewable energy development. The upfront costs of new renewable energy projects are subsidised. Once operational wind or solar parks are given priority access to the distribution grid – they can always market the electricity they produce. Furthermore, the government pays out a “feed-in” tariff. That is, guarantees a certain price for every megawatt hour of electricity generated by a wind or solar farm. These policies have discouraged private investment that might have brought more competitive renewable energy technologies, ones that do not require government subsidies, to market sooner. Nevertheless, Germany’s goal to get 60% of its electricity from renewable sources by 2050 is on track. The eventual success or failure of these policies is the experiment the entire world is watching. However, the rapid expansion of renewables has upset the incumbents – traditional thermal power generators that use coal and gas as fuel. Renewables harm their profitability for a number of reasons. First of all, the average wholesale electricity price is lower. Once a wind turbine or solar panel is installed operating costs are near zero because the wind and sun are both free fuel sources. The price of electricity depends on where inflexible consumer demand matches producers’ supply. The producers with the lowest operating costs are always called on first. Then the price of electricity creeps up the supply curve until consumer demand is satisfied. Every day, every hour, producers receive a price for the electricity they produce based on the last generator called up in the so-called “merit-order.” The graph below illustrates this. The last generator is always less efficient. This means that its operating costs are higher and it will only generate electricity when the price covers these operational costs. 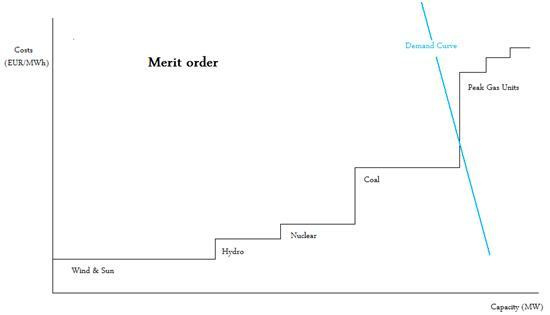 Now that renewables are part of the merit order, we don’t climb as high up the curve as before. On average, prices have decreased, implying the recurrent “last generator” is more efficient than a few years ago. Second, thermal power plants’ operating hours are down. A lot of electricity is being generated from renewable sources replacing supply previously provided by gas and coal power plants. This point is obvious – money can only be earned when your power plant is online and generating electricity. This adds to traditional power plants’ woes. Prices are weakened, but their sale volumes are also harmed as renewable energy production grows. Third, renewables are very variable. Already gas power plants have shut down and new projects have been cancelled because they could not survive the renewables’ economic shake-up. However, some days the sun does not shine, or there is no wind, and traditional generators are still needed. This can vary hour-by-hour, minute-by-minute. Only very modern gas facilities are capable of ramping up and down to balance unpredictable renewable production. Although, this is simply not profitable in a weak price climate where operating hours are down. So, these rapid-response power plants are no longer being built. This is called the “missing money” problem. Fourth: the rise of the prosumer. Households and businesses have been installing solar panels with the hope of decreasing their electricity bills. In some countries, excess electricity that is generated can be injected into the grid earning you cash back from the local electricity retailer. This is how the word prosumer came about. Households connected to the distribution grid were traditionally pure consumers. Having installed solar panels the consumer is now a producer as well. They may even be electricity self-sufficient on sunny days or exceed their own electricity needs, affording them the opportunity to sell back to the grid. Alone, one solar powered household cannot produce enough electricity to perturb the traditional power model. Yet, the arrival of hundreds and thousands of prosumers on the grid has the potential to be very destabilising as seen with commercial solar generation. These four issues are part of a bigger problem: electricity infrastructure and markets are inflexible. They were not designed to manage decentralised and unpredictable electricity production. Nevertheless, this is the model we will have to manage in the future. Distribution lines also have ramping limits constraining how quickly power flows can be increased or decreased. Volatile prosumers and commercial wind and solar farms compromise the grid’s technical stability. And we still need back-up for the days and hours when renewable electricity production is low. Managing variable electricity production demands a model where this responsibility is shared by the market players.